Conjunctivitis, or “pink eye”, is the term used to describe inflammation of the conjunctiva, which is the very thin membrane that covers the inside of your eyelids and the white part, or sclera, of your eye. 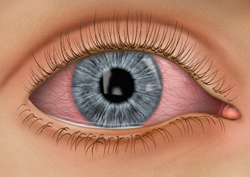 It is most commonly referred to as “red” or “pink” eye and can be caused by a viral or bacterial infection, allergies, or environmental irritants. Viral Conjunctivitis is much more common than the bacterial kind. It may last several weeks and is frequently accompanied by a respiratory infection such as a cold. Antibiotic drops or ointments usually do not help, but symptomatic treatment such as cold compresses or over-the-counter decongestant eye drops can be used while the infection runs its course. Bacterial Conjunctivitis is less common and characterized by considerable amounts of pus. Some bacterial infections are more chronic, however, and may produce little or no discharge except for some mild crusting of the eyelashes in the morning. Bacterial conjunctivitis can be treated with a variety of antibiotic eye drops or ointments. These treatments usually cure the infection in a day or two. Certain types of pink eye or conjunctivitis can be contagious. Conjunctivitis caused by a virus can be very contagious. If you have been diagnosed with viral conjunctivitis or suspect you might be suffering from this condition, practicing good hygiene can help prevent the spread of conjunctivitis if you are infected. Regardless of the cause, conjunctivitis should not cause a decrease in vision. More serious conditions, such as damage to the cornea, very severe glaucoma or inflammation inside the eye can also cause the conjunctiva to become inflamed and pink. If your case of “pink eye” affects your vision or you experience eye pain, you should schedule an appointment. If you or someone you know experiences any of the symptoms of pink eye or conjunctivitis and needs help, please call Baltimore Washington Eye Center at 800-495-3937 to schedule an appointment.